DMCC (SoA) (Society of Apothecaries of London). OStJ (Officer (Brother) of the Venerable Order of St John of Jerusalem). 1st Clasp to VRSM (2007). James Michael Ryan the son of Neil Cornelius Ryan and Maura , was born on Sunday May 27th, 1945 in the district of Moyne (An Mhaighin) Tipperary, Ireland. The population of the parish in 1946 was 1712 (Darmody). The county (Contae Thiobraid Árann), situated in the Munster province is named after the town of Tipperary, and was established in the early thirteenth century, shortly after the Norman invasion of Ireland. James was baptized in the parish church in the village of Loughmore. Four years after James was born, Éire was officially declared a republic following the Republic of Ireland Act 1948. He had one older brother Liam, now deceased (2012) and 4 younger sisters, Mary, Kate, Bernadette and Grainne. Later the family moved to the Dublin area and lived in Bray, a small town , partly in county Dublin and partly in Co Wicklow. James attended St Brendans School (now St Brendan's College) of the Congregation of Irish Christian Brothers. James and his brother were boarders at Rockwell College (Tipperary) (1960-63) which had notable past pupils such as former Presidents of Ireland Éamon de Valera and Dr Patrick Hillary and former Fianna Fáil Senator William Quirke. In 1963 he started medical school at the biggest university in Ireland: University College in Dublin (UCD). The university originates in a body founded in 1854 with John Henry Newman as the first rector known as the Catholic University of Ireland. Many UCD staff, students and alumni fought in the Irish War of Independence that followed the rising. Following the signing of the Anglo-Irish Treaty four UCD graduates joined the government of the Irish Free State. The university's graduates have since had a large impact on Irish political life - four of the nine Presidents of Ireland and six of the thirteen Taoisigh have been either former staff or graduates. 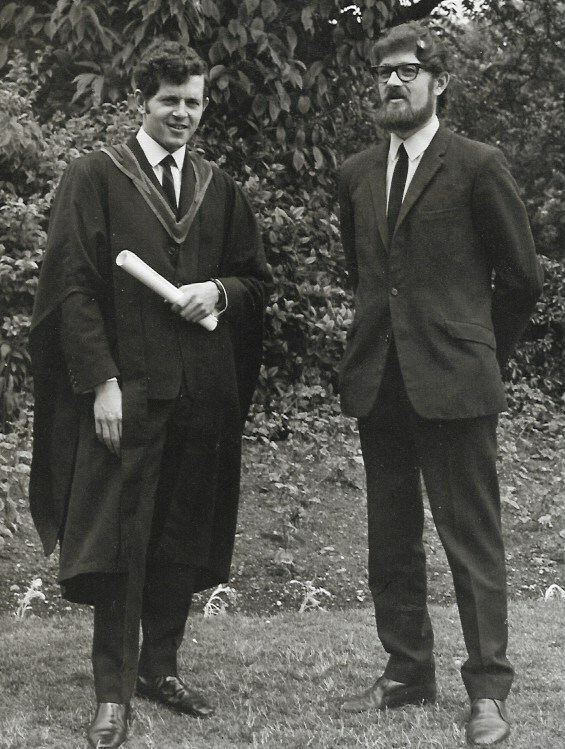 James Michael Ryan joined the British Army in the middle of his undergraduate studies (1967). Initially he took a short service commission of 5 years but stayed on for a full career, retiring in 1994. In 1970 married to Paula , ended his undergraduate medical training and applied for postgraduate studies (surgery) in London obtaining his FRCS in 1978. In 1973 Dr. Ryan was appointed to Cyprus as Regimental Medical Officer with 1st Bn The Parachute Regiment on United Nations Duties. The following year to Kenya as Regimental Medical Officer with 1st Bn The Parachute Regiment on Military & Humanitarian Assistance duties. In 1974 he was Senior House Officer, Accident & Emergency at the Cambridge Military Hospital and in 1975 in Burns &Plastics. Later he was Senior House Officer in General Surgery, Neurosurgery and Orthopaedics at the Royal Herbert Hospital, Woolwich (UK). In 1977/78 he was a Registrar in General Surgery, British Military Hospital, Hannover (Germany). He was sent to Northern Ireland where he had Surgical duties, MPH with 55 Field Surgical Team (FST). In 1979 Senior Registrar, General Surgery, British Hospital, Rinteln (Germany). In 1979/80 Senior Registrar, General Surgery, The Hackney Hospital, London, Lecturer in Surgery, Professorial Surgical Unit, St Bartholomew´s Hospital, London and a year before the conflict was Senior Registrar, General Surgery at Cambridge Military Hospital and St Peter´s Hospital, Chertsey (UK). In 1982 Ryan was Major and a senior resident in surgery in his last year of training. He was called up for service with 55 FST (Field Surgical Team) and sent to the islands, travelling on the QE 2(Queen Elizabeth). They went first to South Georgia and transhipped to a North Sea ferry called the Norland arriving in San Carlos water on 31 May. Ryan was at Ajax Bay, Fitzroy and Stanley with 55 FST. The Sir Galahad was a 3,322-tonne LSL(Landing Ship Logistic) built by Alexander and Sons and launched in 1966. She could carry 340 troops or, when necessary, 534 for short periods. Cargo capacity could include 16 light tanks, 34 mixed vehicles, 122 tonnes of fuel and 31 tonnes of ammunition. Landing craft could be carried in place of lifeboats, but unloading was mainly handled by three onboard cranes. 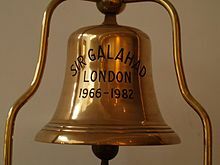 Sir Galahad sailed from HMNB Devonport on 6 April with 350 Royal Marines and entered San Carlos Water on 21 May. 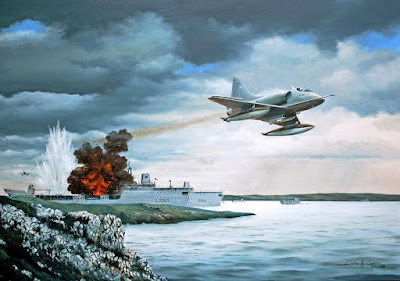 On the 8 June 1982, while preparing to unload soldiers from the Welsh Guards in Port Pleasant, off Fitzroy, together with RFA Sir Tristram, the Sir Galahad was attacked by three A-4 Skyhawks from Argentine Air Force's V Brigada Aérea, each loaded with three 500 lb retarding tail bombs. Lieutenant Carlos Eduardo Cachon(30) glanced at his instruments and opened the communication with the planes that had been left to his command. He repeated the orders and the squadron slid toward the islands. They had to fly high up and down almost flush with the water as soon as they were over the target. All in a very dangerous maneuver of just a few seconds. Flying the Douglas Skyhawk A-4B C-222 (ex USN A-4B BuAer 142752) 6 he carried three 250-kilo bombs made in Argentina. They were the ones that were giving the best result. 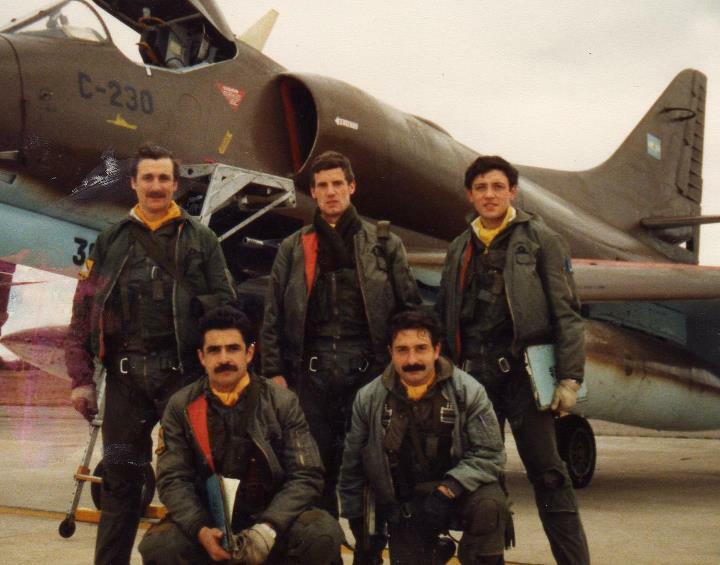 Lieutenant Carlos Alfredo Rinke, Alferez Hugo Gómez and Ruben Vottero. Kneeled: Captain Pablo Marcos Carballo and First Lieutenant Carlos Eduardo Cachon. Cachon was born in 1952 in a field near Balcarce. Fifteen years later his family moved to Mar del Plata and he finished high school there. He was preparing to enter Medicine in La Plata when a friend excited him to go to give the examination to the aeronautical school of Córdoba. "I went because they paid the ticket and wanted to know a different city," says Cachon. His friend was shocked and he approved with very good grades. In 76 he became an aviator.Cachon was awarded the honorific title of Illustrious Citizen by the City Council of Mar del Plata on 25 February 2010. Before they had tried with bombs of 500 and 1,000 kilos but were so powerful that they crossed the warships and exploded in the water. It was midmorning, and Cachon had been flying for nearly two hours. He had advanced for several miles flush with the water and the salt clung to the hatch. Now he was high enough to fall unexpectedly on the target, but he could not see the ships for the salt and the thick fog that covered the bay. From another aircraft comes the expected warning: ¨They are there, on the right, one on each side of the peninsula! " Welsh Infantry soldier Simon Weston (20) from Caerphilly District Miners Hospital in Caerphilly, Wales was ready. Cachon launched the first and second bombs almost at the same time. He watched as they reached the bow and exploded on the deck. The third was directly to the center of the ship, in the machine room zone. The explosive head pierced the first deck and reached the second, where the soldiers were ready to disembark. The explosion occurred directly on two trucks loaded with missile fuel. In a second everything was red, yellow and boiling. "It became hell, it was blood, defense and fire, lots of blood spilled," recalls Simon Weston. Cachon got up and did not know anything else. From another plane they assured him that he had hit the ship, but he could not see anything. He had to get away as soon as possible because he was probably already on the plane radar British people approaching. Weston was hit by the fire. The heat was so intense that it melted the sole of his boots. He tried to lift a wounded comrade, but he had no strength. 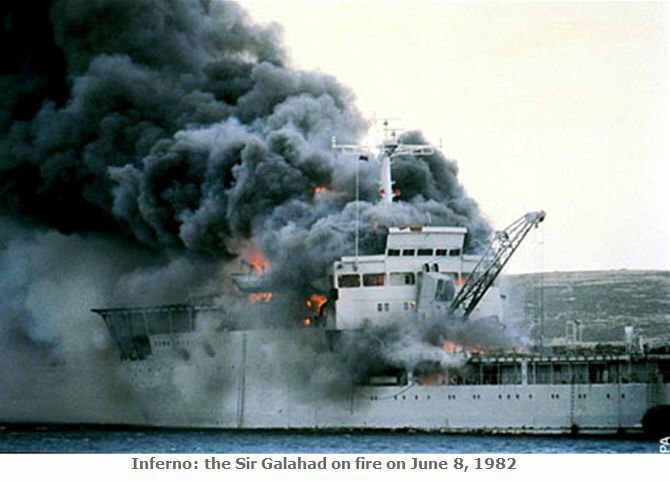 A personal reflection from (Dr Ryan)must include the bombing of the RFA logistic ships RFA Sir Tristam and Sir Galahad which took place on the morning of the 8th of June. Sir Galahad, carrying Welsh Guards rifle companies and elements of the 16 Field Ambulance including the two surgical teams of 55 FST, arrived off Fitzroy settlement. The ship should have anchored in Bluff Coves some 5 miles away but could not get up the narrow cannel to the planned disembarkation beach. For reasons beyond this review disembarkation at Fotzroy was delayed. Some elements of 16 Field Ambulance including No 1 team of 55 FST (Major Jackson´s team)had got ashore but the remaining troops including the author´s team (No 2 team 55 FST)stayed aboard. It seems surreal now with the passage of 25 years. With the departure of 16 Field Ambulance and David Jackson´s team the author and a group of other Officers retired to the Wardroom. Lunch was taken and the group stayed in the Ward room comforted by tots of whiskey, hot cofee and a dubious movie on the Ward room TV monitor. Sometime later and without warning(and the autor is still uncertain about timings)Sir Galahad and Sir Tristam were bombed by a flight of Argentinean fighter bombers. Chaos ensued those of us in the Ward room were thrown from our seats by the explosions, we were uninjured but were now trapped in a blacked out and smoked filled room. We were quickly rescued by a young unnamed 2nd Lieutenant in the Welsh Guards who found a hatch behind the bar which led out to a passageway going forward and out onto the open deck which reasembled a melee. We quickly realised that a very large number of our comrades had been killed and a greater number wounded most of them on the tank deck which had taken a direct hit. Others taking the air out in the open were also killed. Among the dead was Major Roger Nutcam, second in command of 16 Field Ambulance, Lt Col Jim Anderson, officer commanding 55 FST and anaesthesist with no 2 team had also been outside and was badly injured. All the FST equipment, along with much of 16 Field Ambulance´s stores wasdestroyed. The ship was abandoned, many, including the author, clambered into dinghies and life boats. Others were winched directly off the ship by helicopters hovering over the deck. These pilots and crews displayed extreme gallantry the ship was on fire and exploding ammunition was propelled skywards towards the rescuing helicopters. The survivor came ashore at Fitzroy and were cared for by those already ashore.The author well remembers being sheltered by WO2 Les Viner RAMC under a mound of peat smoking his cigarrette and drinking whiskey from his wáter bottle. For a time at least, the autor while safe and well was incapable of direct assistance to the on-going rescue effort. In concluding this episode it is interesting to reflecto n the accuracy of books reporting historical events even those written during or shortly after the event. The author has a book entitled ¨The Scars of War¨ by Hugh McManners, a friend from the conflicto. In describing the Sir Galahad episode(which was related to him by someone who was in the USA at the time of the attack! ).Hugh switches David Jackson´s team and the author placing the author ashore during the attack and with Jackson still on board at the time the reverse of which actualy happened. It makes one cautious about veracity and accuracy when persuing historical works. On 21 June, the hulk was towed out to sea by the R.M.A.S Tug Typhoon and sunk by HMS Onyx; it is now an official war grave, designated as a protected place under the Protection of Military Remains Act. The casualties Fifty six people died including Welsh Guards, three RFA officers and two Chinese crews and 150 wounded. 4,5,7 Hongkongers Leung Chau (an electrical fitter) and Sung Yuk-fai (a butcher), perished among the flames, explosions and toxic smoke that quickly engulfed the decks. Add to the tally two Hong Kong men - seaman Yeung Shui-kam and bosun Yu Sik-chi - who died on RMA Sir Tristram in the same bombing run, and this becomes the highest death count suffered by British forces from a single attack during the 11-week war. He was subsequently awarded the DSO for his leadership and courage. Chiu Yiu-Nam (born 1949), from Guangdong province, mainland China, a seaman on RFA Sir Galahad realised that there were soldiers trapped inside. Wearing a protective asbestos suit, he fought his way through the smoke and flames into the bowels of the ship, where he was confronted by scenes of confusion and devastation. After leading out one man, he went back for another. He continued to return, bringing men to safety until he realised that there was no one left alive. Only then did he obey the order to abandon ship. In 1983, he agreed to fly from Hong Kong to London, where the Queen invested him with the George Medal . He retired from the RFA in 1989 for health reasons, and lived quietly with his mother and younger brother in Hong Kong. 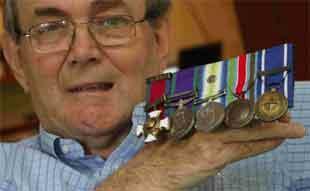 He declined an invitation to fly to London for the 25th anniversary of the Falklands conflict. 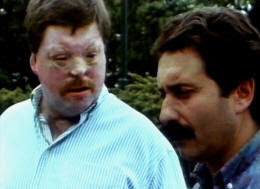 Simon Weston suffered 46 per cent burns and his story has been widely reported in television and newspaper coverage. Weston endured years of reconstructive surgery, including over 70 major operations or surgical procedures. Skin from his shoulders was used to make eyelids and his nose was grafted on in a later operation. He suffered psychological trauma, drinking heavily and becoming suicidal, and admits his behaviour during this time was "terrible". 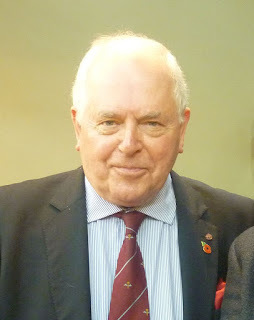 He credits his mother with helping him to overcome this, in particular, her act of reuniting him with his old regiment, who refused to mollycoddle him (especially Glen White, who ran the Welsh Guards rugby side), forced him to "face up to the unavoidable and to be positive about everything including especially my future". Falkland Islands – 2000 Advisor in surgery and trauma to Falkland Islands Government. James Michael and Paula have 3 children (now adults) David 45 years old. Emma 42 years old and Rebecca 38 years old. 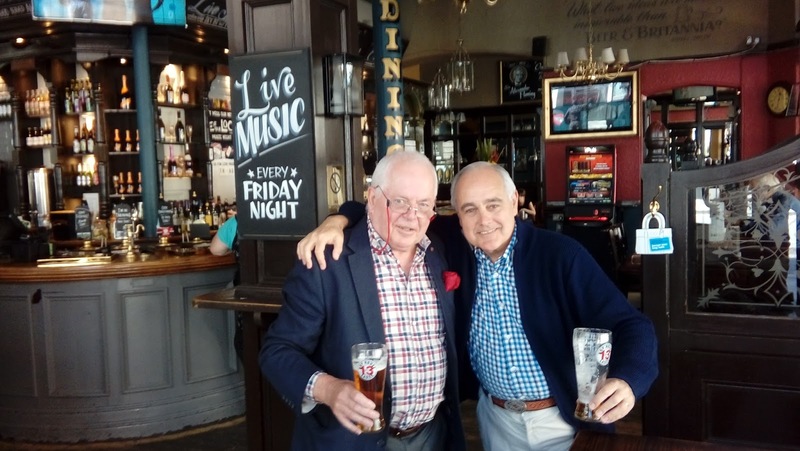 London 2017-Dr James Michael Ryan and the author. Jackson, DS, Batty, CG, Ryan JM, McGreggor WSP-The Falklands War-Army Field Surgical Experience. J R Army Med Corps 153(1):23-24. Malvinas vidas cruzadas, vidas paralelas-El que arrojó la bomba y el que recibió el impacto. Clarín- Domingo 8 de abril 2007. Ryan, JM-A personal reflection on the Falkland Islands war of 1982-J R Army Med Corps 2007 ; 153:88-91. Williamson, David-Chilling account of Sir Galahad attack reveals soldiers should have left ship –WalesOnline-28 Dec 2012.